You will be given a reference e-book to read which has 174 pages And the test will be based on that e-book , you can take final test within 1 year of purchase. Portfolio management refers to the popular art of choosing the perfect investment policy for a specific individual basing on maximum returns and minimum risks. It should be noted that a portfolio can be defined as an effective collection containing investment tools including shares, bonds, cash, mutual funds and stocks based on the income, the most convenient time frame and budget of an investor. This portfolio actually comes in two major types namely the zero investment and the market portfolio. A lot of experts define portfolio management as the process of effectively managing the investment of an individual which usually comes in the form of shares, mutual funds, cash and bonds to increase his chances of earning the highest level of profit within a specified time frame. It also refers to an effective money management process which is handled with the help of the expert assistance and guidance of a certified and efficient portfolio manager. Portfolio management comes in different types. These include active portfolio management which involves selling and buying securities to guarantee maximum profits, passive portfolio management which involves using a fixed portfolio which is primarily designed to meet present market scenario, discretionary portfolio management which takes place when you authorize a certified portfolio manager to handle your financial needs and the non-discretionary which involves receiving mere advices on how you should handle your finances and investments. This process is extremely beneficial because it allows you to develop the most effective investment plan basing on your age, budget, income and your ability to deal with risks. 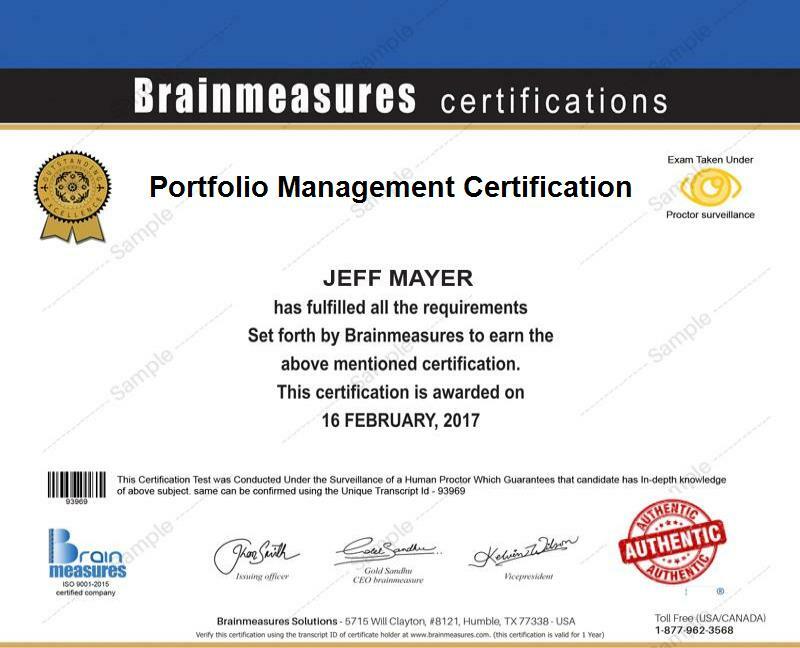 The portfolio management certification program which is now easily available at Brainmeasures is now one of the online certification courses that can work ideally for you if your desire to work in the portfolio management industry is extremely strong. You can expect this portfolio management course to be highly beneficial for you because it is guaranteed to work in your attempt to generate a clearer and more complete understanding about the field of managing portfolios. With the highly comprehensive portfolio management training provided in this program, you will find it easier to understand what are the different types of portfolio, how you can effectively manage each of them, the scope of the whole portfolio management process, the different approaches and styles that you can use in portfolio management and the best tools that you can use once you already become a certified portfolio management expert. A portfolio management certificate is extremely rewarding because it represents your high level of proficiency in the field. The extreme importance of portfolio management at present makes the act of enrolling in the portfolio management certification program offered by Brainmeasures highly beneficial. This certification program is capable of providing numerous benefits to all existing and aspiring controllers, finance managers, financial planners, accountants, portfolio managers and any other professionals in the financial and investment industry. Increasing the level of your annual salary is also greatly possible if you already hold a portfolio management certification. Receiving a portfolio management certification is your ticket towards grabbing the position of a portfolio management consultant and earn around $68,000 to $151,000 per year. Working as a certified portfolio manager is even more financially rewarding because it allows you to enjoy an annual pay of approximately $78,000 to $192,000.